I've done exactly what you're supposed to do to install OptiFine about 20 times over now, with all the different versions for 1.13.2. Each time, I get the crash in pic related. I've checked the logs. 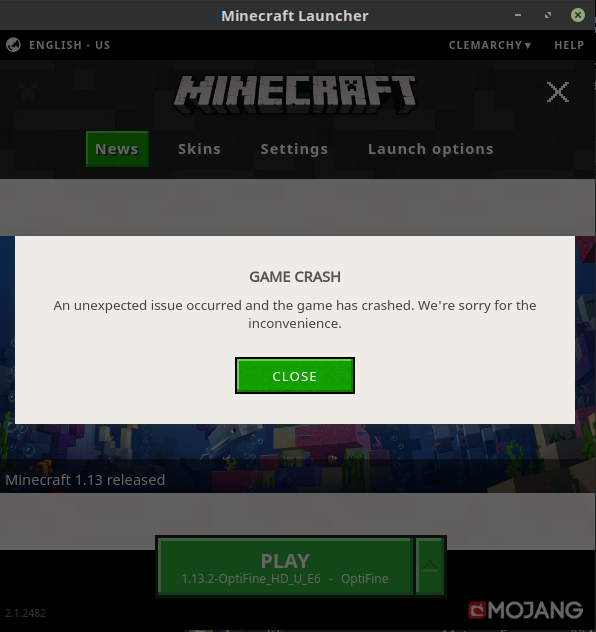 I've tried using older versions with older versions of MInecraft, too. Is it my computer? I'm running a Dell Latitude E5430 on Linux Mint 19.1. It's not the best, but it's no craptop. I figured it would at least be able to start up. Please help me. ... Post a copy of it here (in spoilers preferably - or use pastebin) & maybe someone here can see what you may've missed & be of help. I checked the logs again. I don't know how I managed to miss the big red highlighted "couldn't get hash" message. Any idea how to fix?